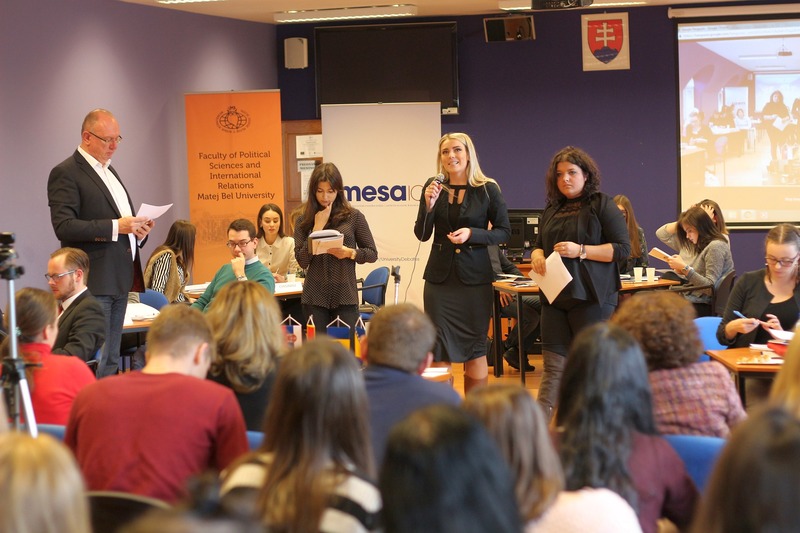 First round of student debates between seven universities from Slovakia, Serbia, Bosnia and Herzegovina, Montenegro and Moldova within the project “Strengthening Debating Skills and Promoting Democratic Values among Youth” took place on Wednesday, December 7th,2016, in Banská Bystrica, Slovakia. Students were debating questions of European and world security and political situation, with focus on European Union and NATO. Most pressing questions were impact of the election of Donald Trump for the US president on the relations between Europe and the United States, the impact of pro-Russian candidates, who are successful in elections in European countries on the strength of EU accession-ambitions of those countries; as well as the question if Brexit will make European Union stronger or weaker. When discussing impact of the election of Donald Trump for the President of the United States on the cooperation between EU and the US, students tended to believe that neither the US nor Europe can work alone. Economic cooperation between US and Europe is according to them the most important as it sets the standards in the world. Some opined that the presidential candidate Donald Trump underestimated the economic power of Europe; stressed that political choices and decisions are based on the values, and if these are not respected, it will also influence the cooperation between US and EU. But they also remarked that it seems to them that the American mentality has been changing: from helping others to focusing on domestic agenda. Regarding pro-Russian elected leaders and Russian influence in Europe students held the opinion that if the US were to leave from Europe, Russia would seize the opportunity to gain more influence. They said that had Russia once demonstrated that it can remain consolidated, the countries in Europe’s East would start cooperating with Russia. But if Russia keeps its current policies, and the EU continues to offer real opportunities, these countries will rather look the EU direction. They also noted that in the Western Balkans, Russia is behaving in a smarter way than the US and the EU. When discussing Brexit, students believed that Brexit was caused by the United Kingdom having too many opt-outs. Yet, Brexit is still not a done thing for them. Also, the students noted that the EU is totally reliant on the security provided by NATO, but it should rather shift its focus from other issues to defence and security. Project “Strengthening Debating Skills and Promoting Democratic Values among Youth” is initiated and managed by MESA10 from Slovakia and CEAS from Serbia. Participiting universities are Comenius University of Bratislava (Slovakia) and Matej Bel University of Banska Bystrica (Slovakia), University of Belgrade (Serbian) and University of Novi Sad (Serbia), International University of Sarajevo (Bosnia and Herzegovina), University of Montenegro (Montenegro), and Academy of Economic Studies of Chisinau (Moldova). Project is supported by National Endowment for Democracy. More information on the project can be found on the facebook webpage https://www.facebook.com/UniversityDebates/, and on the webpage www.mesa10.org.